Requires RJ45-5EWTP-CB for a waterproof connection. "Use RJ45-5EWTP-CAPT orRJ45-5EWTP-CAP to protect the connector when not in use. 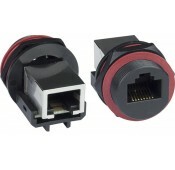 "These are very nice connectors for weatherproof applications. Seals are furnished and are of good quality. The cover cap (seperate item) also comes with a seal."